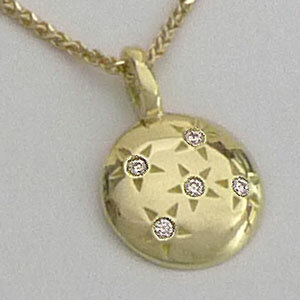 One side of this original pendant shows five diamond stars within a gold universe. 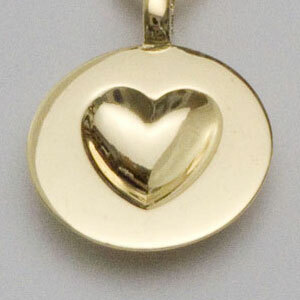 The other side has a melting heart design, with the subtle hint of a heart softly set into the surface. Each of the diamonds has been handset into this solid, 18k Yellow Gold design. (5/8" did). A 14k gold chain is included. Comes packed in a wood box. Wood is the traditional material for a fifth anniversary gift, so if you were thinking of buying this as an anniversary gift, it's both traditional on the outside and uniquely origin on the inside! A White Gold, Starry Sky Necklace is also available.